At Blue Star Trailers, we’re proud to offer a wide range of trailers that are suitable for everything from transporting tools through to moving cars. 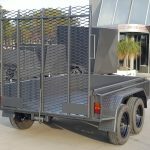 If you’re looking for plant trailers in Melbourne, look no further. 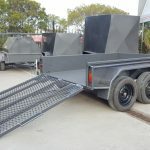 We can supply you with a locally made plant trailer that’s built to last and constructed from the highest quality Australian steel. 1500 mm drop down ramp. 4 Tie-down points on floor. Tie down railing all over guards. Two coats of hammertone grey. 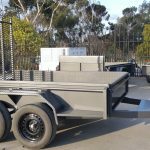 Our plant trailers for sale in Melbourne can also come with optional extras, including your choice of colour, ramp size, and new tyres and rims. All of our models also come complete with a structural warranty. Want more information before you buy a plant trailer? Call Blue Star Trailers today on (03) 9042 4390 to learn more about our plant trailers for sale in Melbourne.